What’s trending in Home décor this year? Vibrant colors, warm metal tones, use of natural wood, and luxurious Victorial era style. Patterned wall coverings with paisley, floral, and abstract designs. Cerused Woods - cerused and limed-wax finishes in dark gray and black colors. Marble is being used in flooring in colors of light gray and white. It is also used for countertops and tabletops. Real and faux animal leather hides are being used for texture. Bronze and brass knobs are preferred nowadays. Smaller hardware elements and drawer pulls have become popular lately in shiny metal finishes. Velvet fabrics are being used to decorate sofas and cushions. 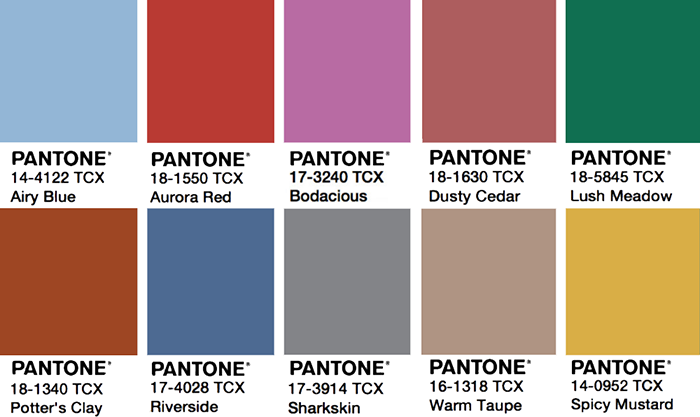 The fabric colors have been introduced in all of the Pantone colors.